Whether you have a charming backyard, a proper garden, or a small porch, this list of native plants is perfect for enjoying the outdoors as well as a great way to keep your community beautiful and show your knowledge of native plants. Plumeria Tree: Famed for its sweet fragrance and stunning beauty, the plumeria tree is a must in any local garden. The Guamuchitl: The most beloved tree of our local wildlife. Put one of these in the corner of the yard, and you are guaranteed sightings of exotic birds, green iguanas and more as it fruits. 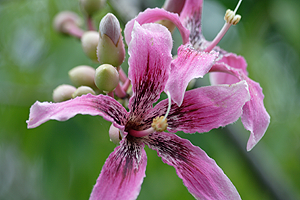 Click here for a better look at what these native plants have to offer and some interesting facts on the Ceiba flower, pictured above.